Copenhagen-based independent music label, Indisciplinarian, this week releases the Carrion debut LP by their countrymates, eclectic doom/sludge trio, RECITATION, and in advance, the entire album is now playing at Vice Magazine’s music channel, Noisey. The disturbing, low-end demoralization RECITATION perpetuates drags down-tuned doom riffage and earthmoving percussion through the outer fringes of death metal, jacking every moment full of dread. Fueled by maggot-infested and feedback-soaked crust/sludge tactics and mega-guttural vocal depravity, the band still jacks their music up with a cosmic, psychedelic vibe, resulting in output that is as devastating as it is mind-bending, perfectly suited for those who follow the works of Grief, Yob, Noothgrush, Corrupted, Burning Witch and the like. The band’s debut album consists of one twenty-seven-minute track — the uncompromising “Carrion” — yet this solitary movement does not grow repetitive, bland or complacent. Instead, it writhes, morphs and consumes everything in earshot; the musical equivalent of an all-consuming supernova. Bask in the contamination of RECITATION‘s Carrion via Noisey now at THIS LOCATION. Indisciplinarian, will release Carrion on October 9th in a run of 300 copies on black vinyl. Preorders have been made available to the public through Indisciplinarian HERE,as well as through the label’s US mailorder partner, Earsplit Distro, HERE. 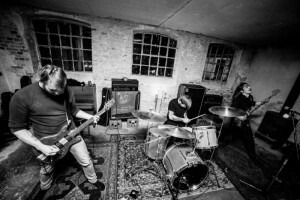 RECITATION played its debut show in their hometown of Copenhagen, Denmark on September 20th and has also booked a record release show for Carrion on October 10th, also in Copenhagen, with additional tour dates, news and more to be announced shortly. Thematically, RECITATION‘s Carrion LP deals with the human feelings of meaninglessness and depression when confronted with the harsh reality of inevitable decay and death – a basic condition for all flesh that inhibits the earth and beyond. The album is a dark and feverish journey undertaken to a music of demise – a crushing, monotonous movement through a desperate musical night, where the riffs rise as monoliths of death, telling a tale of what little time we are given. The voyage can be described as a non-linear composition consisting of a series of repetitive progressions giving way to the vibe, the riff and a slow crushing feel in a way that conjures up an experience of stretching time and presence. It’s music working on another level of being – metaphysical and yet very present in the earthly life. It’s a journey that you undertake, painfully aware, while led astray – a journey we all have to take.